If you haven’t used lambda expressions before, you might be wondering what the fuss is all about. After all, at the most basic level, they’re nothing more than a new, somewhat simpler way to implement single-method interfaces. But the fact is, there are real, tangible advantages to using lambda expressions instead of more traditional approaches to implementing functional interfaces. To get a full understanding of the benefits of lambda expressions in Java and how they provide conciseness and readability, just look at how functional interfaces, that is, an interface that only defines a single method, were implemented prior to lambda expressions. There were basically two approaches that could be used. One approach was to define a separate class that implements the interface, while the second was to use an anonymous inner class. The benefits to this approach is the ability to share the new class among multiple code bases, so reuse is possible. The disadvantages to the single class approach? For starters, there is code bloat, as a whole new class is required to implement a single method. Furthermore, the logic is separated from the point in which it is needed, which will make troubleshooting and code maintenance more difficult in the future. To address the shortcomings of this approach, Java 1.1 introduced the concept of anonymous inner classes. An anonymous inner class allows developers to define and implement a functional interface at the point in the code where it is needed. In the prior example, we needed to create a separate class named MyComparator. With anonymous inner classes, you don’t define a separate class, you simply implement the methods requires, thus the name anonymous. Here’s how the Comparator example looks when implemented using an anonymous inner class. Anonymous inner classes are popular, and much preferred over creating separate implementing classes. They also allow for the implementing code to be written at the spot in which the code is used, which makes troubleshooting and long-term maintenance easier. There are drawbacks to anonymous inner classes though. One major drawback is that the code does not look pretty. If anything, it looks bloated. Furthermore, the ability to reuse this code is muted, as there’s not way to invoke an anonymous inner class from outside of the code in which it is defined. And a more innocuous issue with anonymous inner classes is the peculiar variable scope they introduce directly within a class. Variables defined outside of an inner class do not employ the traditional rules pertaining to block scope within a Java class. As a result, it is easy to fall prey to a bug-inducing anti-pattern known as variable shadowing. This can create bugs that are very difficult to troubleshoot. With lambda expressions, the goal is to minimize as many of the drawbacks to using a single class or anonymous inner class when implementing a functional interface, while at the same time maximizing the benefits. 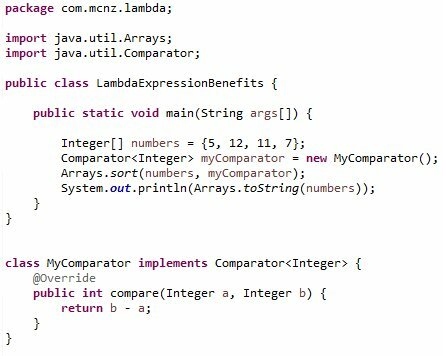 If you look at the Comparator example implemented using a lambda expression in Java, there’s no debating the fact that the code is much more concise and compact. Concise and readable code is a benefit of lambda expression use in Java. Furthermore, there is no potential for variable shadowing with lambda expressions, eliminating a major downside when using inner classes. It should also be noted that even inner classes create a new .class file when the application is packaged and deployed, something that doesn’t happen with lambda expressions, providing the minor benefit that the deployment artifacts that get created are marginally more compact. This simple example of lambda expressions is only sufficient to demonstrate a few of the benefits of lambda expressions in Java as compared to other approaches. As you explore lambda expressions at a more advanced level, you will discover how they also make iterative processing easier using the new, functional forEach method. And because lambda expressions can be assigned to a variable, they provide an opportunity for reuse that simply isn’t possible with anonymous inner classes. It took a long time for lambda expression to finally make it into the Java language, but given the benefits of using lambda expressions in Java code, it’s no wonder that developers are excited when their target deployment platform gets upgraded to a newer version of the JDK.